HomeFor ClientsAnalyticsForex Analysis & ForecastsForex Technical analysis and forecastsForex Technical Analysis 2011/02/18. EUR/USD,GBP/USD, USD/CHF, AUD/USD, NZD/USD Forecast FX. Forex Technical Analysis 2011/02/18. EUR/USD,GBP/USD, USD/CHF, AUD/USD, NZD/USD Forecast FX. As it is seen from the eurusd analysis the EUR/USD has been corrected a bit lower than expected. 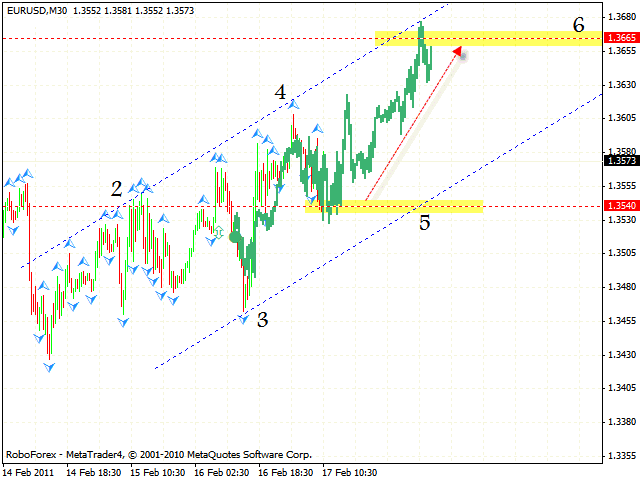 However, at the moment one can try to buy the pair with the stop below 1.3530. The target of the growth is the area of 1.3665, but if the price breaks the rising channel’s lower border this case scenario will be cancelled. The general target of the Wolfe Wave is the area of 1.3900. Pound, as Euro, has fallen down. At the moment the price is moving inside the risingchannel, and one can try to buy the pair with the target in the area of 1.6430. 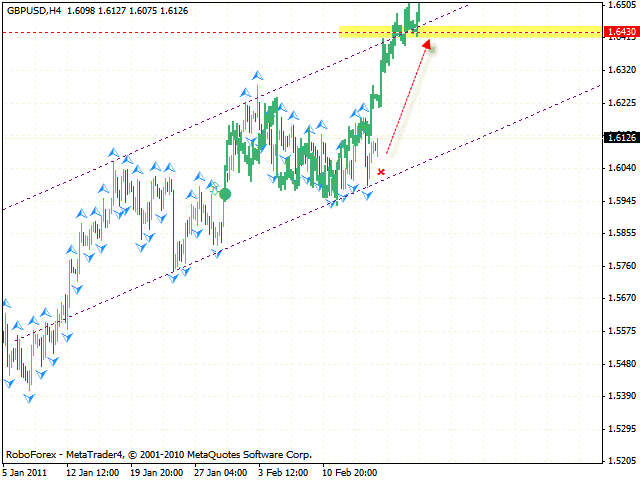 According to the gbpusd analysis the stop must be below 1.6040. One more possible scenario is the price breaking the channel’s border. As it can be seen from the technical analysis usd chf in case of Franc we have “head & shoulders” reversal pattern formed with the target in the area of 0.9382. The closest target of the fall is the level of the 4th point of reference in the area of 0.9470. 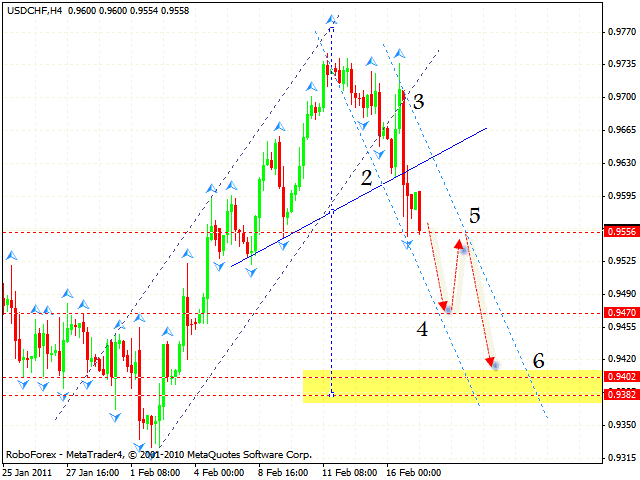 Then we should expect the pair to be corrected to the area of 0.9556 where we can consider continuing selling Franc. But if the pair grows over the level of 0.9700, this case scenario will be cancelled. Australian Dollar is moving according to the aud usd analysis. 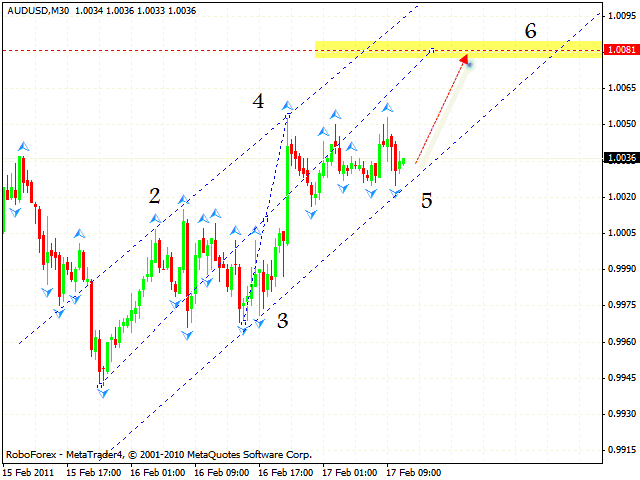 At the M30 chart we have the rising symmetrical pattern forming with the target in the area of 1.0081. One can start buying the pair with the tight stop at current prices. If the price breaks the channel’s lower border, this case scenario will be cancelled. New Zealand Dollar has also started moving upwards. 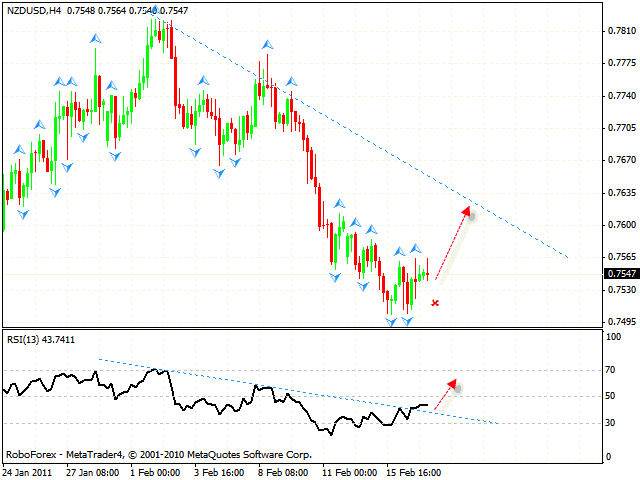 At the 4 hour online forex trading chart the RSI indicator has broken the trend’s descending line, and we should expect the similar line to be tested at the price chart in the area of 0.7610. Judging by the nzdusd forecast you can try to buy the pair with the stop below 0.7520.But if the price reaches new local minimum at the level of 0.7500, this case scenario will be cancelled.